The following rules apply to all ranges. Range infractions may result in expulsion from the club. Only members and paid guests may use the range. Membership card must be displayed. If you come to the range without your membership card you will be sent home. All shooters and spectators must wear suitable eye and ear protection. Juniors must be supervised by a senior member. No alcoholic beverages permitted on the ranges. The first Shooter on a range is Designated Safety Officer and has full control of Range. The normal firing line has preference, but the shooters may agree to move the firing line forward. When anyone is down range no weapons shall be handled. Actions shall be open and magazines removed. Except where noted only paper or cardboard targets may be used. All targets have to be placed on the backers between the uprights. No fully automatic, simulated fully automatic or hip shooting is allowed. Always make sure your weapon is pointed in a safe direction so any discharges will not leave club property. Police your brass including miss fires. Remove all targets when you are done shooting. This Guthsville Rod and Gun Club range is attended for classic bulls-eye shooting. However, it can be used for other shooting sports as long as the specific range rules are followed. The firing line of the range is covered to protect the shooter from the elements. Pistol calibers only, no magnum loads. All shooting from the established firing line. Only paper or cardboard targets in the target frames. This Guthsville Rod and Gun Club range is suitable for many types of shooting. Any rifle or pistol caliber; shotguns using slugs No 50BMG. Suitable steel/novelty targets may be used. They have to be placed at the bottom of the backstop. They can only be shot using pistol calibers from the normal firing line. Rifle shooting is to be done from the normal firing line. The 50-foot range at Guthsville Rod and Gun Club is a wide open range. In addition to shooting from the firing line, many shooters use this range to practice shooting on the move for such Sports as IDPA and USPSA. When shooting from other than the normal firing line please watch your muzzle direction, and be considerate of other shooters who may want to share this range. Suitable steel / novelty targets may be used. They have to be placed at the bottom of the back stop. Guthsville Rod and Gun Club 50 yard range provides a shooting range for those who want to shoot at 50 Yards. There are benches for bench rest shooting. There is room at the firing line to fire standing sitting or prone. The firing line is fully covered so you are protected from the elements. Any rifle or pistol caliber; shotguns with slugs only. No 50BMG. This range is for shooting at the longest range possible at Guthsville Rod and Gun Club. There are benches for bench rest shooting. There is room at the firing line to fire standing sitting or prone. The firing line is fully covered so you are protected from the elements. This Guthsville Rod and Gun Club Range are for archery and Trap shooting only. Bow and arrow and crossbows only. Make certain that the shooter is forward of anyone operating the thrower or hand throwing the birds. All birds have to be either hand thrown or thrown with the permanent thrower. Follow the instructions and rules posted for the thrower. Hand thrown birds are to be thrown in the same direction as the thrower. Shotguns only with bird/target loads only. No Slugs or Buckshot. The Guthsville Rod and Gun Club Back Powder Range are reserved for Black Powder shooting only. Follow all black powder safe handling rules. The Plinking Range at Guthsville Rod and Gun Club is a range for those who like to shoot at other than paper and cardboard targets. This range is a great range to start new shooters. Pistol calibers only, no magnum loads. Shotguns shot only. Targets may be Aluminum cans, plastic containers, and clay birds only. Targets have to be placed at the base of the hill no higher than ten feet. Place all used targets in the trash barrel. 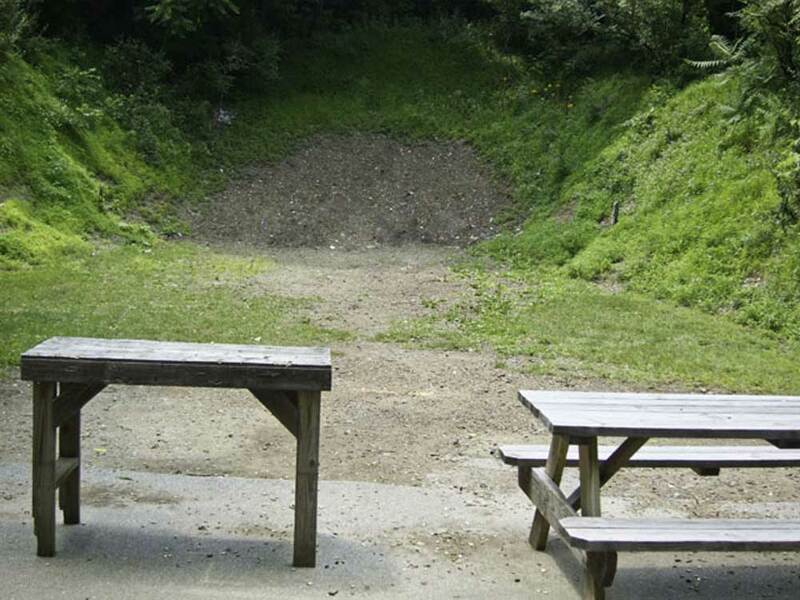 This Guthsville Rod and Gun Club range is wide open and is suitable for a wide range of shooting. Any rifle or pistol caliber; shotguns using slugs or shot. No 50BMG. Suitable steel/novelty targets may be used. They have to be placed at the firing line such that the uprights will not be damaged. They can only be shot using pistol calibers from the normal firing line.